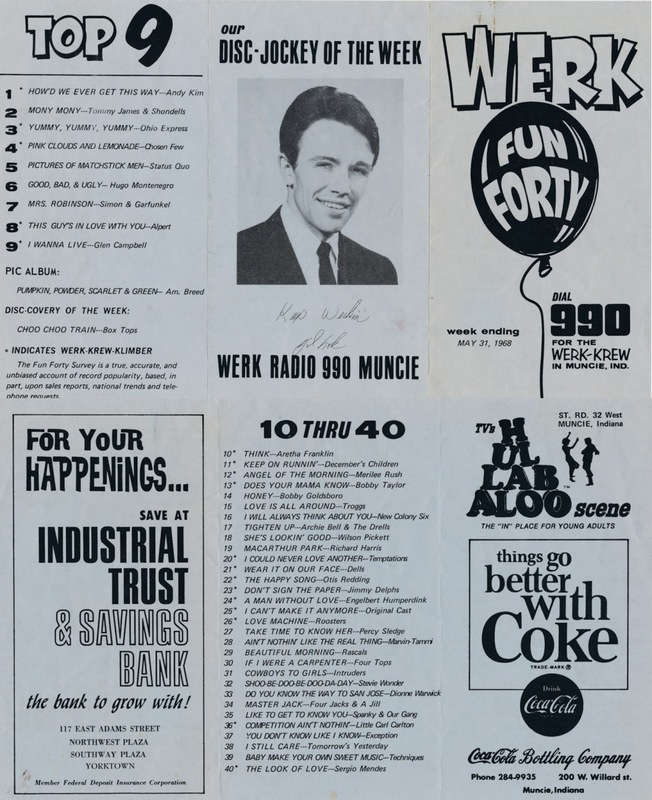 Muncie is just an hour east of Indianapolis and gave plenty of airplay to Chicago and Indy bands in '68. Muncie had some popular combos in '68 and one such, the Chosen Few, sat at #4 this week with their very poppy "Pink Clouds & Lemonade." Their next release would be bought by RCA and be a minor chart item, "Maybe The Rain Will Fall." Muncie also laid claim to December's Children, who had the #11 hit with their decent version of Spencer Davis Group's 1967 hit "Keep on Runnin'." Canada's Original Cast sit at #25 a year before they added an "e" to their name and had a hit with the FIRST version of "One Tin Soldier." #37 will be showcased NEXT week! Cool to see Andy Kim at #1 with "How'd We Ever Get This Way." Our FH Buddy Carl Wiser just interviewed Andy about his big hit from 50 years ago. In addition to the acts Clark has mentioned above, we've also got The American Breed with the Pic Album Of The Week ("Pumpkin, Powder, Scarlet And Green") and, on the singles chart, The New Colony Six at #16 and Spanky and Our Gang's new one at #35. As promised yesterday, here’s an email that proves once again that “It Takes All Kinds”!!! Just came up to "this so called review" that is not a review at all but something you have written down - and maybe paid for by Mr. Art Garfunkel. Yes, I also bought a ticket for the Amsterdam show in Koninklijk Theater Carreé Weesperzijde Amsterdam. How can you already write a review about THIS CONCERT while this show is still going on? Last week I received an information email from Mojo Concerts, the company I bought the ticket from. This show would start at 20.00 in the eve and will be ended on the time of 21.40 hour. Also, a break of 20 minutes was announced in this email. What the hell is this for a kind of show? And apparently you have a very thick thumb for putting up and writing such a nonsense regarding all this stuff. I know Art Garfunkel has been an actor and this was one of the causes for Paul Simon to get rid of him. Paul Simon had nothing to lose; the only one still being the loser was and still is Art Garfunkel. I do not believe your words regarding what he might speak about Paul Simon during all upcoming concerts in Europe. As Paul Simon said, "Let Artie fight out his demons" … and I wish him the same. Fortunately, Paul Simon is - indeed - in more than excellent shape and having lots of fun and interactions with his visitors who did and will do visit his Paul Simon Farewell Tour. I’ll be there in Amsterdam, too, for a marvellous show - without having any break - for two and a half hours. Please keep going on deceiving people who do not know what kind of a man Art Garfunkel is … a devil in disguise. When I am listening to Art Garfunkel, it is all about "me, me, me." Paul Simon never speaks about himself or what a great voice he still has. He is not interested at all in what people think about him and whether people like him or not. Shut up with your Art Garfunkel … Tab Laven and Dave McKay … screwing people by asking extraordinary prices for ONE ticket. Kind regards and I will have a look in the Dutch papers for any review that might have been written tomorrow Guess not. Whew!!! That’s a WHOLE lotta hate for one email!!! For starters, the review I ran was a “guest review,” written by Shelley Sweet-Tufano, a regular contributor to Forgotten Hits. The concert that Shelley reviewed took place on May 17th at Tarrytown Music Hall in Tarrytown, New York … so no, it wasn’t a “review from the future” … nor was it a paid endorsement of Garfunkel’s show. (Anybody who tried to get tickets for this thing already knows how expensive these tickets were!!!) That being said, with so much hate in your heart for Art’s talent, why on earth would you spend this kind of money to see somebody you clearly can’t stand?!?! Honestly, after reading your comments, I fear for his safety!!! How you can interpret this review to be about a concert that hasn’t taken place yet tells me you didn’t pay very close attention to what you were reading. It sounds to me like you’ve already made up your mind well in advance as to Artie’s talent and ticket prices … so again, why go at all??? Get ready for four straight days of postings again as we attempt to dig ourselves out of all this email!!! And, of course, The Sunday Comments! and The 101 Strings Orchestra on two box sets — 50 Inspirational Favorites, and The Enduring Light. Those are the obvious ones from my Phonolog. I'm betting on Paul Mauriat. 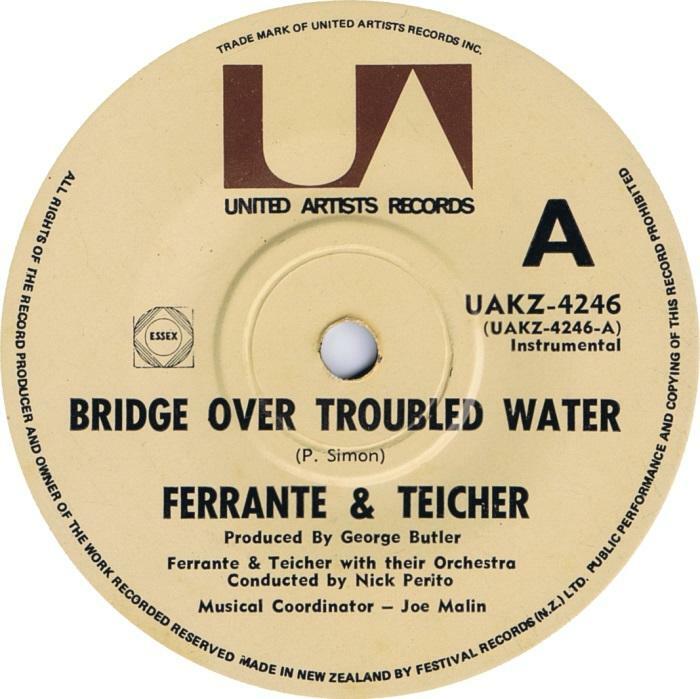 Could he have meant those towering titans of the duel piano sound, Ferrante and Teicher? Several years ago, when I was the Program Director for the oldies station here in Lincoln, I was able to get a service that provided oldies songs that were being released in stereo. As a part of that service, they had several oldies artists themselves tell the story behind the song. They're no longer in business but sure wish there was something like that now. Just wondering if you know where I can get oldies artists audio? 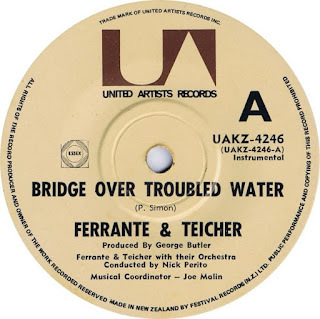 In particular, I'm looking for stories behind the hits from the artists themselves. I can find stuff on the internet but its taking a massive amount of time. Thanks, Kent, for any help you can offer. On Saturday, June 9, THE FAB 4 MUSIC FESTIVAL, New York / New England's regional Beatles-themed music festival, will "come together" at the Toyota Oakdale Theater in Wallingford, CT. There will be a total of 20 bands playing both indoors under the Dome, and outside on the "Octopus' Garden Patio, from 1 – 10 pm. One act just added to the line-up will be a very special attraction for fans. Earlier this year, a video went viral on YouTube with a pair of brothers doing spot-on vocals of John Lennon and Paul McCartney harmonizing in the New York City Subway system. The buskers, who sound like they're from Liverpool, are two musicians who happen to be brothers, caught listeners by surprise who may have expected them to be performing songs by Bob Marley or Stevie Wonder judging by their looks. More than half a million views later, brothers Rah and Amiri Taylor were invited to perform and tell their story on the Ellen DeGeneres Show. Their band is named Blac Rabbit. As a result of their television exposure, Rah and Amiri, were invited to play the Fab 4 Music Festival. The internet sensations and media darlings will be closing the "Octopus' Garden" outdoor patio stage with a 7:30 set. This popular family-friendly Music, Foods & Arts Festival, produced by long-time Beatles fan and promoter Charles F. Rosenay!! !, will feature the music of The Beatles, their solo material and classic songs from the sixties. Along with the great entertainment of 20 bands, there will be Beatles and music memorabilia dealers and vendors, exhibitors, kid-friendly activities, along with food trucks and other attractions. Other outside patio artists on the "Octopus's Garden" stage include Dramatic Turn's Brideau & Miller, Fools On The Hill Sal & Allen, Dizzyfish Acoustic with Eric Herbst, The Navels, Scott Ringle, David Tessier's Pre-Fab Monkees All-Star Show and Suns of Walrus. Bands on the "Pepperland" main stage indoors include such New Haven area bands as The Hofners, Penny Lane, Number Nine, The Taxmen, Corporation TeaShirt and Take Two & Call Me In The Morning. Also performing on the Pepperland stage are under the dome are Rotary, Double The Dial, Pat Horgan's Thunder Road and Beatlehead. Aside from Rah and Amiri Taylor, another national act will also be performing at the festival, sixties rock band The Fifth Estate, who had a hit on the Billboard charts in 1967 and were also contacted by The Beatles' manager Brian Epstein to manage them. Rosenay is very much looking to the event, which is the 40th anniversary of his very first Beatles Convention in 1978, and it's the 50th anniversary of some famed Beatles albums. In 1968, The Beatles produced their most whimsical work, "Yellow Submarine," as both a record and theatrical animated film, and they also recorded their most intense collection of songs released as a two-record set, "The White Album." In celebration of the 50th anniversary of these historic releases and the year 1968, advance "Ticket to Ride" general admissions are only $19.68 (plus any service fees). There are also V.I.P. tickets available. Note that admission will be higher at the door. Advance tickets available at Ticketmaster. The "Fab 4 Music Festival" on Saturday, June 9, 2018, is presented by Rosenay's Liverpool Productions in partnership with Live Nation. Festival MCs will be Rosenay and radio personalities Brian Smith from WQUN and Ken Michaels from WNHU and KenMichaelsRadio.com. The official charity of the festival is "Concert With Causes," a 501-c3 Wallingford charitable organization. There is ample free parking.